Under the plan, presented to the Community Board 9 transportation committee last night, Amsterdam would gain painted bike lanes between 113th Street in Morningside Heights and 162nd Street in Washington Heights [PDF]. The new configuration would eliminate one through lane in each direction — with some exceptions where car traffic is heaviest — and add left turn bays, left-turn treatments to slow drivers, loading zones, concrete pedestrian islands, and painted curb extensions. Motorists killed four people walking and severely injured 28 pedestrians and eight cyclists on Amsterdam from 110th to 168th between 2010 and 2014, according to DOT. Dozens of intersections inside the project area saw more than 10 injuries each between 2010 and 2014, and there were around 600 total injuries along the corridor during that time frame. DOT staff stressed the need for safety measures on Amsterdam, a wide street with no designated space for biking, long crosswalks, and intersections designed for fast turns. Seventy percent of motorists on Amsterdam exceed the speed limit during off-peak hours, according to DOT. DOT plans to add concrete median islands to provide a refuge for pedestrians and slow turning motorists at 14 intersections. An unspecified number of intersections would get painted curb extensions to slow turns and shorten crossing distances. While the project would stripe bike lanes where none currently exist, connecting the Upper West Side to Washington Heights and linking up to painted lanes on Amsterdam at 168th Street, it has some weaknesses on top of the lack of protection. 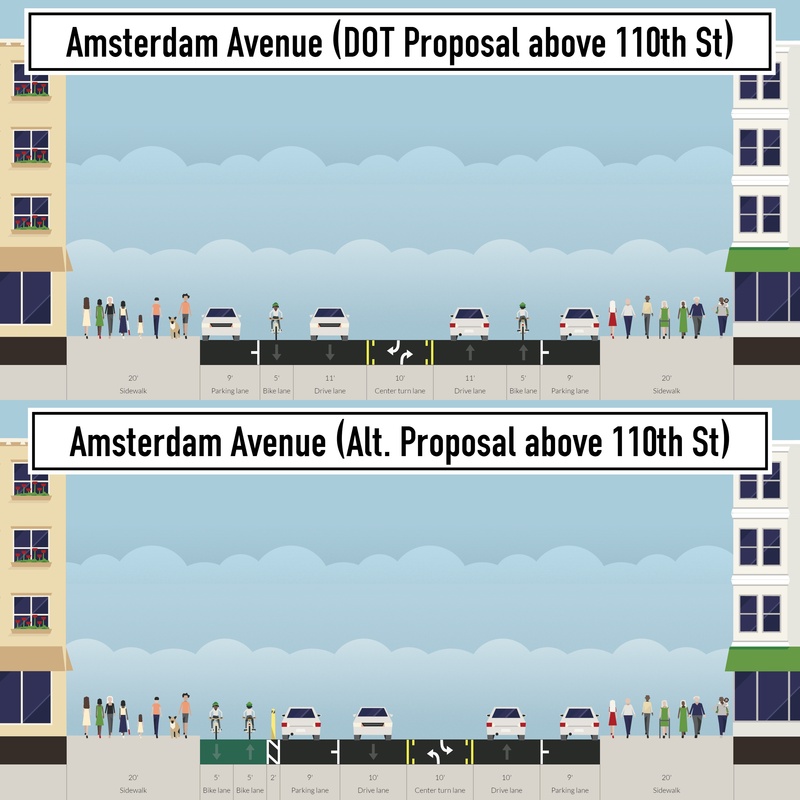 Between 113th Street and 110th Street, where Amsterdam changes to two-way from one-way northbound, DOT will keep two travel lanes in each direction and add sharrows. And during the morning and afternoon rush at 145th and 155th streets, parking would be restricted in the east curb lane to make way for through-traffic. This would position northbound cyclists between two lanes of moving motor vehicles. When members of the public expressed concern about the southern end of the project, where the northbound protected lane would give way to three blocks of sharrows, DOT staff suggested cyclists concerned for their physical safety could “peel off” to other streets. One woman explained that with painted bike lanes, drivers often bully cyclists who have to veer around other drivers who are double-parked. DOT staffers said that getting a protected bike lane installed would take years, presumably referring to the length of a hypothetical political fight, whereas the proposed design, which the agency described as a “compromise,” could be built out in a few months, and could be improved upon later. Most CB 9 members seemed OK with the project as proposed — it was a tension-free presentation — but the committee took no formal action last night. DOT plans to present the plan to CB 12 soon, and return to CB 9 in May. Implementation could begin in early summer and be completed this year. That’s OK. People don’t mind sacrificing themselves and their loved ones if it spares DOT from standing up to people like Ann Pfoser Darby. The lane reduction is going to make a big difference during the day. It has done so elsewhere during peak traffic periods. But yes, painted lanes are largely useless. Regardless of the design, left side bike lanes really fail when the street becomes 2-way. The transition from Schermerhorn to Lafayette in Brooklyn is an example of this at its most hostile, frequently trapping people cycling on the wrong side of 2 lanes against the curb. Using a 2-way lane to avoid this problem, as on Chrystie, is rarely an option. As for these Class II lanes, they should be much more comfortable to double park in than the existing outside lanes. They’ll be barely clear of the door zone and will feel like lane splitting when there are cars stopped in the adjacent lane. What’s not to like? It’s not a “compromise” if you never pushed for anything more. It’s also a key link between 3 different Columbia campuses. same number of lanes; just a reallocation of one lane to more efficient mode. even included 3 blocks of sharrows ! yes – even more reason for PBL along this entire stretch to match the yugely successful PBL below 110th. I like your alternative much better. Honestly, I don’t know that I feel any safer riding in a PBL than a Class 2 because of the “mixing zones.” There is much less stress riding in a PBL until you hit the mixing zone, which the careening left-turning vehicle brings all the stress left behind for the past block and a half screeching back and then adds a little extra. What I would like to see would be your plan including split phase signals at all left turning intersections crossing the bike lane. There are split-phases at every eligible intersection on the original sections of the 8th and 9th Ave lanes in Chelsea. Much of Broadway too, from 58th to 26th. Trouble is the left turn phase takes a big wet bite out of the time that cyclists can actually go through; it’s very frustrating. Much of the time there isn’t that much traffic turning anyway, and cyclists get in the habit of going straight through even on their red phase/the green left turn phase, which doesn’t help matters either. In the southbound direction, riders headed to the UWS will probably tend to turn off left onto a cross street, right onto Morningside Drive, and then continue on Columbus. Many cross streets at or south of 123rd will do for this. Heck, all of 116, 115, 114 and 113 will do; oddly, they are all two-way or one-way eastbound. The northbound option is stickier. The current Amsterdam PBL stops at 107th btw, not fully up to 110th. Without a natural barrier/few cross streets (Prospect Park, SDR Park, etc. ), I think this sets up cyclists to get walloped by cars making turns and forgetting the bike lane is there too, especially left turns across oncoming traffic first. It brings to mind the current situation on Ocean Parkway, which is crap. 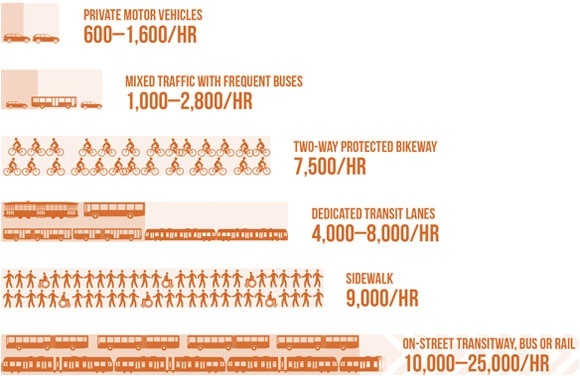 Once again, DOT will protect human life only if street changes won’t affect vehicle throughput in the least and/or can be done with community board approval. So they’re willing to settle for a certain number of inevitable deaths and serious injuries over the next five years, just fewer than we’re getting now. If de Blasio is serious about achieving Vision Zero, he’s going to have to do better than this. That intersection is crazy dangerous. Creating any really safe way for bikes to navigate from the left side bike lane to the right side at 110th street is going to be very hard, as far as I can see. What if they put a giant, green-painted box at the left where there is now a wedge of park, and then a green painted “cross-bike” path ….for bikes to cross during an extended walk light… and then provide a bike light for them to cross before the cars turn left.? What exactly is the argument FOR bike lanes on the left side of the street on giant one way avenues anyways? I jumped into the CB12 Transportation meeting this evening where the northern portion will conclude. The DOT engineer claimed to be hesitant for a class I due to the two-way nature of the avenue and the width. I wish something like Jay Street could be implemented but Amsterdam includes the turn bay. I’m glad that CB9 members seemed “OK” with the project because CB12 brought out their guns against the bike lanes. There was a lot of tension and acrimony towards the DOT on the southern end of CB12. I’m curious to see their proposal to the full board. Doors to buses in current fleet are on right side of vehicle, obliging buses to run along right side of “giant one way avenues” to board from sidewalk. Bicycles therefore get a lane on the left side of the street to avoid conflicts with buses. Declare victory and move on to the next project. There’s more to being an advocate than sitting in community board meetings. Of course cyclists are going to go through the light all the time, but we as cyclists are going to be more attentive to the cars and will be more likely to yield to them than they would to us. But cyclists must always yield when we don’t have the right of way. The few that don’t really set a bad name for all of us who do. Oh, don’t get me wrong, that’s a reasonable decision if there’s really nobody coming. That’s how I do it, and I’d estimate about 40% of riders are in that class. The remainder seem to ride through on on the bike red/left green in Beautiful Godzilla mode whether or not there’s turning traffic which should expect a clear path now. It’s frustrating to see. I guess nothing is perfect…..but reason 3 only works for non-protected bike lanes. Numbers 1 and 2 make a lot of sense. Not even street throughput! There’s enough room for a 2-way protected bike lane.